There is hardly any communication with Beira. Erratic at best, mainly by SMS, and Movitel works in some suburbs. Power lines are down so there is no power – hence even with limited cell phone reception, charging phones is not possible. Potable water is in scarce supply. Food will be in short supply since some of the major retailers were destroyed. Roads have been cut off to the city. A major bridge was washed away isolating the city. Many areas are submerged under water. Beira city is littered with debris and glass. Although the city is really damaged, local residents have begun cleaning up the debris in the city – the problem is in the surrounding areas which are mostly under water. Hotel Tivoli Beira has half its hotel operating and is hosting residents and journalists. They have a borehole so they have water and limited food supplies. It hasn’t stopped raining since Sunday. Help is on the way from the International Federation of the Red Cross, the EU, Portuguese Embassy and medical rescue teams some of which are already on the ground. Air access has been restored, however, there is damage to the control tower and runway lights. Small aircraft were severely damaged in the hangar. On the other hand, Maputo has blissful weather and we are completely untouched by this disaster in the centre of Mozambique. We are praying for those affected – some of which are family members of our team. More than a 1000 people have been killed in the devastating cyclone Idai which tore through Mozambique, Malawi and Zimbabwe last week, AFP reports. Tourism Update notes that the Mozam port city of Beira has been hit the hardest, with reports saying that about 90% of the city has been destroyed. Follow News24's live update for details and to see how you can help with this devastation. According to a press release, UNICEF is appealing for $20 million (R287 501 000) to support the response in the three affected countries. Mozambique, much more than golden and white sandy beaches, prawns and peri-peri chicken, this unique African destination offers travellers a wealth of memorable experiences. With its magnificent coastline, warm turquoise waters teeming with fascinating marine life and abundance of coconut filled palm trees, Mozambique on the face of it is worth the visit just to enjoy the natural splendour of this south-east African nation. Despite this, the culture, history and adventure opportunities make this south-east African country a worthy addition to any African travel itinerary. A community protest at the Giriyondo Border and Massingir District in Mozambique on Wednesday 5 September is making entry to Kruger National Park inaccessible from the Giriyondo Gate. Visitors to and from Mozambique are advised to usee alternative routes through Pafuri Border and the Corcodile Bridge Gates to enter and exit the park until further notice. It is always advisable to be cautious when making travel plans, ensuring you have the necessary travel insurance in place - as well as take the necessary precautions. Visas: Not required for holders of South African passports for stays of up to 30 days. Passport validity: Passports need to be valid for at least 30 days after the return date. Useful app to download: FlightView (iOS, Android) app for flight tracking and information. Due to its relatively close proximity to South Africa, there are direct flights from South Africa to Mozambique available from most major South African cities. From Johannesburg, you can fly direct to Maputo, Beira, Nampula, Pemba and Vilanculos, and from Durban, you can fly direct to Maputo. Airlines that service these and other flight routes include South African Airways, LAM Mozambique Airlines, South African Express, Airlinkas well as Comair's regional subsidiary British Airways. Flight time: The average flight time from Johannesburg to Maputo is 68 minutes. Average flight time from Cape Town to Maputo is approximately 2 hours and 45 minutes long. Currency: Mozambican Metical (The South African Rand is widely accepted though). Mozambique, like many African countries, should be approached with caution when it comes to medical care and disease prevention. A yellow fever certificate, as well as malaria prevention medication is essential when travelling to Mozambique. Ensure your routine vaccinations for hepatitis A are in order, as food and water standards are questionable in certain areas. Another potential medical pitfall to avoid is typhoid which you can get through the consumption of contaminated food or water so get vaccinated particularly if you’re planning to go off the beaten track. Religion: Christianity is the dominant religion but there is a substantial Islamic community in the country too. Travel Adapter: Yes - The power sockets are of type C, F and M. The standard voltage is 220 V and the frequency is 50 Hz. The main form of local public transport used in Mozambique is called a chapa. This is the name of nearly any vehicle, barring buses and trucks, that operate within and between towns. You should expect a ride less comfortable than what you may be accustomed to back home in one of these. They can be hailed almost anywhere, similar to the minibus taxis in South Africa. Like the buses in Mozambique, chapas tend to leave early in the morning for intra-city travel. Where possible, consider taking a bus instead. Busses also connect the major towns to one another and are another mode of transport that is popular in Mozambique. Long-distance intra-city travel buses, buses going north, usually depart very early in the morning. Just as with the chapas, you should prepare yourself for a less-than-comfortable journey in a vehicle that is in a less-than-ideal condition. Make sure you are aware where your bus is departing from as there is generally no central bus departure area. There are few cab companies operating in smaller towns in Mozambique, although you will definitely see some around Maputo, particularly around airport arrivals. You can negotiate a fair price with cab drivers but be informed, some unscrupulous cab drivers will charge exorbitant prices if you don't know better so research ahead to gauge how much you should expect to pay for a cab ride over a particular distance. Useful App to download: LiveTrekker (iOS, Android) for keeping a digital travel scrapbook. 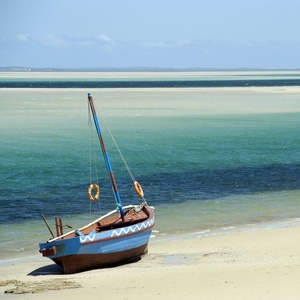 Travellers to Mozambique can expect to enjoy an inviting tropical climate with few extreme variations in temperature. The rainy season runs from October through March and the dry season is from April through September. Average temperature ranges in Maputo are from 13 to 24 °C in July to 22 to 31 °C in February. The months from May through November are cooler and dry making this an ideal time to visit the country. Due to a lack of road infrastructure, the December through April rainy season can cause occasional flooding and temporarily unusable roads, particularly in the South making this less than ideal if you’re planning on driving around the country. If you’re thinking of heading to Mozambique for a Christmas/New Year holiday break then you might want to start booking right now as the South African school holidays sees droves of South Africans head to Mozambique filling out resorts, particularly in the South. Language: Portuguese is the official language although Swahili, Makhuwa, and Sena are commonly spoken. Much like South Africa, though it is the first language of a minority of the population, many Mozambican citizens speak English as a second or third language so you’ll rarely be able to battle with communication outside of the main tourist centres. That being said, it is always good to learn a few key phrases to make your stay runs smoothly. Bom dia (good day/morning) or boa noite (good evening) or olá (hello) and tchau (goodbye). Mozambicans are friendly, easy-going folk and are receptive to being approached by foreigners. Just remember to expect them to speak English as well as you speak Portuguese and you won't have any unpleasant surprises. It is usual, and just good form generally, to treat people with respect and exchange social pleasantries before trying to extract information. Mozambique is a developing nation and as such, you can expect to see poverty-stricken areas and undeveloped spaces. These people deserve all the respect and dignity you would accord any other human being. Please don't reduce what can be an eye-opening cultural experience in a poverty safari by callously snapping pics of people and how they live. Ask permission and engage with the locals. Respect for elders is an incredibly important aspect of African culture and Mozambique is no exception. Be prepared to give up your seat and always treat elders and those in positions of authority with deference. Be modest when visiting religious sites - shoulders, torsos and thighs should be covered out of respect. You can expect to do a lot of walking so comfortable shoes you don't mind getting beat up are a good idea. You should expect to haggle over prices in markets for the best deals. Just don't overdo it. Many of these people make a living by selling their wares. Speak to other locals to find out what they usually pay for a particular good to find out if you'd be making a fool of yourself trying to bargain to a price below what locals pay. Be fair. Prepare for an onslaught of mosquitoes. Buy or bring all the creams, sprays, candles and nets you can get your hands on. Avoid the tap water. The quality is inconsistent at best and sickness-inducing at worst. Buy bottles or bring a portable filter. Carry identification AT ALL TIMES. This is a law and it is strictly enforced. You must be able to present an identity document if a police officer requests it at any point.